SME has recognized several professionals who will assume new leadership roles in the organization for 2017. 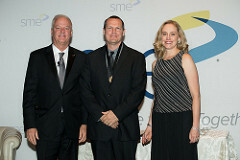 These manufacturing professionals were recognized at the annual SME banquet on Nov. 12. Michael D. Packer, FSME, Lockheed Martin Aeronautics Co.
SME also recognized its 2016 Class of Fellows, who are selected once a year from among the highest achievers of industry, academia and government, and nominated only by honorary, fellow, life or professional members of SME. Those selected as fellows have 20 years or more of manufacturing experience and expertise. They have contributed notably to the social, technological and educational benefit of manufacturing and the engineering profession. Joseph J. Beaman, ScD, FSME, The University of Texas at Austin, Austin, Texas. Sandra L. Bouckley, FSME, GKN Driveline Americas, Auburn Hills, Michigan. Hitomi Yamaguchi Greenslet, Dr. Eng., FSME, University of Florida, Gainesville, Florida. Behrokh Khoshnevis, PhD, FSME, University of Southern California, Los Angeles. Brad L. Kinsey, PhD, FSME, University of New Hampshire, Durham, New Hampshire. Ashok Kumar, PhD, FSME, University of South Florida, Tampa, Florida. Lonnie Love, PhD, FSME, Oak Ridge National Laboratory, Oak Ridge, Tennessee. ZJ Pei, PhD, FSME, Kansas State University, Manhattan, Kansas. Tony Schmitz, PhD, FSME, University of North at Carolina Charlotte, Charlotte, North Carolina. Hong-Chao Zhang, PhD, FSME, Texas Tech University, Lubbock, Texas. Nominations are currently being accepted for the 2017 SME College of Fellows. 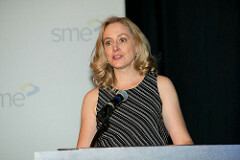 Submit nominations on or before Dec. 1 at sme.org/fellows.